Do you know that massage therapy is more than just a luxurious indulgence, but one that can make you feel better inside out by helping you to relax, minimize stress, relieve muscle aches, enhance circulation, improve sleep and even increase brainpower? If you want to have a massage but don’t know which one that suits you, here is my quick guide on the most popular types of massages that you can try. Swedish massage is by far, one of the most sought-after Western-inspired massage therapies there is. It is a staple offered in all generic spa salons and is widely practiced all over the world. It generally involves long, smooth strokes, kneading, gliding, and circular movements with the use of massage oils or lotion. If this is your first time to have a massage, this is a good choice to start with because it can be gentle and revitalizing. A traditional form of Buddhist physiotherapy that effectively fuses acupressure, reflexology and yoga, Thai massage is likened to having a yoga session without doing the actual work. Massage therapists use their hands, elbows, legs, knees and feet to initiate deep yoga-like stretches and positions on the recipient. It helps you to feel more relaxed, boost energy, improve flexibility and circulation in the body. Thai massage is typically performed on a mat, similar to Shiatsu. If you frequently experience back aches and soreness all over your body, you might want to undergo a deep rhythmic stretching from a Thai massage. Do not worry if you think you won’t be flexible enough to do this because you can actually instruct your therapist on how much flexibility you can manage. This is a popular Japanese acupressure that applies finger pressure in rhythmic strokes to restore the flow of energy and maintain balance. It is promoted to relieve stress, anxiety and even depression. The technique is based on pressures from fingers, elbows, knees and feet. It is traditionally done on a futon mat or on the floor with the recipient fully clothed. To help you feel more relaxed and connected while having a Shiatsu massage, slowly and deeply breathe into your abdomen almost as if you are having a meditation. Deep Tissue massage utilizes various techniques that focus on the deeper muscle layers and tissues. It is commonly used to reduce chronic pain, inflammation, repeated strain, postural issues and to recover from injuries. The massage therapist will apply friction or deep pressure on the grains of the muscle. Many people will find this somewhat painful and a little uncomfortable. It’s best to let your therapist know if the pain is outside your comfort level. You might experience some stiffness after the session, but it usually would be gone after a few days. With Aromatherapy massage, it incorporates scented essential oils massaged on your skin. It is used for those who wish to feel energized, relaxed, relieve pain, promote positive mood, aid in digestion, decongest sinuses and a host of other health benefits. Lavender is a top choice among the other essential oils used in Aromatherapy massage. Many people would often associate this with an ordinary foot massage; however it can also be used on ears and hands as well. Reflexology is based on a belief that when pressure is applied on the reflex areas of our hands ears and feet, it transmits signal to corresponding organs or glands via the nervous system. This signal create balance in the nervous system and discharge important hormones like endorphin to reduce stress and pain level. This is highly recommended for those who have tired feet, arthritis, back pain, hormonal imbalance and stress-induced conditions. 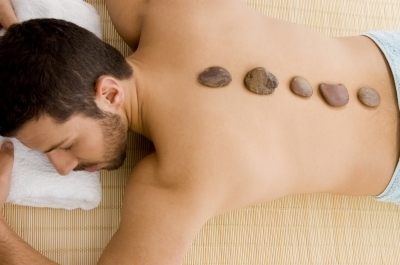 This is a must-try massage therapy that uses cold or warm smooth stones to massage different areas of the body. Hot stones are actually basalt stones heated at a specific temperature and placed at the back of the person, the palms of the hands and in between the toes. It deeply penetrates and loosens tight muscles, reduces tension and helps fight off insomnia. ©The Cebu Spa and Wellness Guide. All rights reserved.